TAMPA, Fla. (AP) — The Phoenix Coyotes went extra time to get a much needed victory. 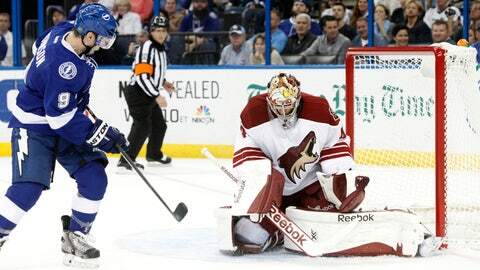 Radim Vrbata scored the lone shootout goal to lead the Coyotes past the Tampa Bay Lightning 4-3 on Monday night. Vrbata beat Ben Bishop with a backhand. Mike Smith stopped all three Lightning shootout shots. Brandon McMillan, Martin Erat and Mikkel Boedker scored for the Coyotes, who trailed eighth-place Dallas by one point in the Western Conference. Phoenix was coming off a 3-2 loss Saturday at Washington, a game which the Capitals had three unanswered third-period goals. "We’re right in the hunt," Smith said. "We’re in the thick of things, too, and every point matters right now. So I think you see a desperation from guys on the ice, lying down, blocking shots." Ondrej Palat got the Lightning even at 3-all with his second goal of the game, coming from the low slot with the Tampa Bay net empty and 37.2 seconds left in regulation. Palat also had an assist. "I thought we did a lot of things well tonight," Phoenix coach Dave Tippett said. "Even though they got a late one on us, we found a way to get points, and that’s the biggest thing about our season right now. We need points every night." Tampa Bay, 1-4-2 since the Olympic break ended, also got a goal from Tyler Johnson. After Erat scored following an errant defensive zone pass by Lightning defenseman Victor Hedman 2:13 into the third, Boedker put the Coyotes ahead 3-2 with a rebound goal at 7:48. Bishop ended up out of position when Hedman’s pass on Erat’s goal took a bad bounce. "We were just way too lackadaisical," Tampa Bay coach Jon Cooper said of Erat’s goal. "The third one, we’ve run that coverage a thousand times. It’s a blown assignment. Those don’t go in in midget hockey, let alone the NHL. Or they shouldn’t, anyway." Palat gave the Lightning a 2-1 lead from in-close off a pass from Ryan Callahan with 52.3 seconds left in the second. Johnson scored his fourth short-handed goal and 20th overall this season to put the Lightning up 1-0 at 11:26 of the first. With Steven Stamkos off for hooking, the rookie went around stumbling defenseman Keith Yandle and put a backhand past Smith. 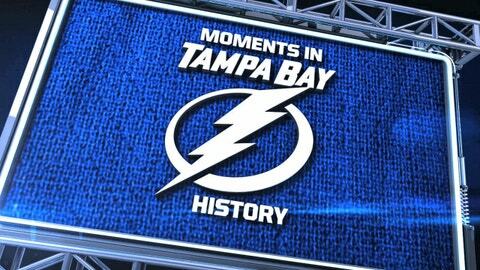 After not having a short-handed goal last season, Tampa Bay has nine in 2013-14. The Lightning have a short-handed goal in three straight games and six of their past 15. McMillan tied it at 1 on a rebound goal 61 seconds into the second after Bishop stopped Yandle’s shot. Tampa Bay defenseman Sami Salo left after three shifts in the first period with a lower body injury. Stamkos was pointless in his third straight game since returning from a broken right shin that sidelined him for 45 games. "It’s going to take him a little time to get back to normal," Cooper said. Stamkos played 23:31 and had two shots. NOTES: Boedker stopped a 13-game goal drought. … The Lightning will unveil a statue of former captain Dave Andreychuk in a pregame ceremony April 5 before hosting Dallas. It will depict Andreychuk hoisting the Stanley Cup over his head after the Lightning won it in 2004. … Phoenix C Martin Hanzal has resumed skating, but missed his fourth consecutive game with a lower body injury. He had a goal and three assists in the Coyotes’ 6-3 victory over Tampa Bay Nov. 16. … Coyotes D David Schlemko (lower body injury) is returning to Phoenix for treatment. … Coyotes D Brandon Gormley made his NHL debut. … Vinny Prospal was at the game scouting for the New York Rangers. The forward announced his retirement following a 16-year NHL career in January.